Priority 5 provides Homeland Security, Defense & key agencies with advanced data visualization software that empowers decision makers with a common operating picture of real-time events. When a major political event was about to put Priority 5 on the world’s stage, Priority 5 chose Borenstein Group to develop a high-impact website and video collateral to introduce the innovators to the market and earn new business. 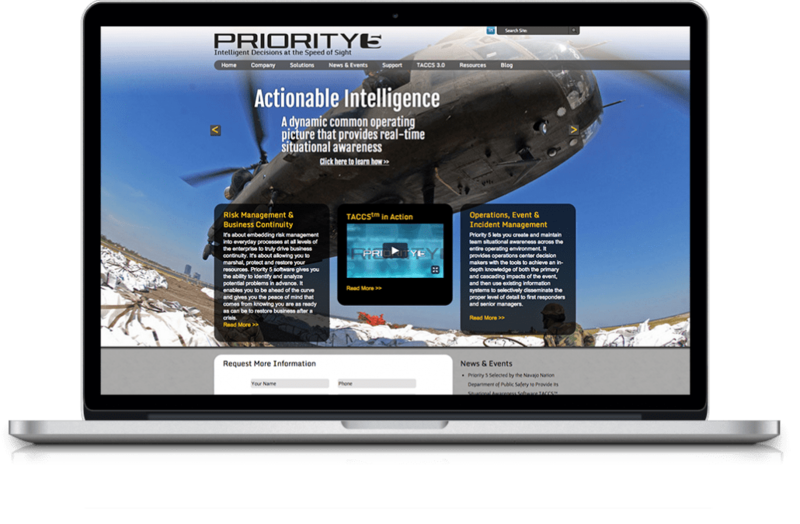 Priority 5 Holdings is a trusted provider of software solutions for situational awareness and decision support. The company’s innovative products include software tools, interactive dashboards and analytical frameworks which operate in a single, cohesive platform. Priority 5’s versatile, flexible and interoperable software was selected by security coordinators for use at the 2013 Presidential Inauguration. The Priority 5 team tasked Borenstein Group with undertaking a comprehensive rebranding effort in a short 25-day time frame in order to deliver in time for the event. The tasks included internal messaging, redesign of company website, multiple case studies, white papers and brand architecture. Borenstein Group strategy team began by conducting intensive interviews with senior leadership, managing directors and other key stakeholders in order to identify issues regarding the existing brand. The team conducted a thorough competitive analysis to determine effective positioning tactics. Borenstein strategists and creative team then developed messaging including brand pillars, mission, vision and values statements, as well as an engaging and impactful new tagline. The team then generated case studies and white papers to further convey the message. Borenstein design and development team produced a new, accurate, captivating and user-friendly website featuring latest advancements in responsive design. The website was implemented on a content management system. The highly interactive and user-friendly CMS offered greater flexibility and performance, allowing Priority 5 marketing team to make quick and accurate updates as needed. Borenstein copywriters worked closely with Priority 5 in-house communications managers to write compelling web copy that explains the value of Priority 5 in a manner that enables the target audience to understand the highly technical aspects of the Priority 5 offerings. The direct one-on-one approach and the intense dedication to achieving a successful product enabled Borenstein Group to complete the requirements in time for the Presidential Inauguration. 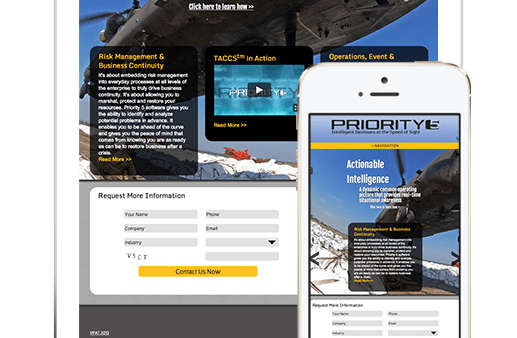 The new creative brand and targeted messaging launched Priority 5 as a top competitor in the field of situational awareness and event disaster recovery. Borenstein Group’s strategic approach and creative execution enabled Priority 5 to achieve its goals, expand its reach, and be seen as a leader in their field, while effectively communicating highly technical terms to the targeted audience.